Walmart is shifting into ‘Uber’ mode again. Less than three months after its collaboration with the ride-sharing firm ended, the giant retailer has embarked on a new venture that seeks to harness a pool of independent drivers. To expand its delivery options, Walmart has teamed up with Bringg, a crowd-sourced delivery platform for the final mile, where independent drivers sign up for windows of time when they are available. Under the Spark Delivery brand, a pilot programme is running in New Orleans and Nashville and Bringg says it intends to expand into more markets before the end of the year. Drivers are paid per delivery. Customers pay $9.95 per delivery for a minimum $30 order. 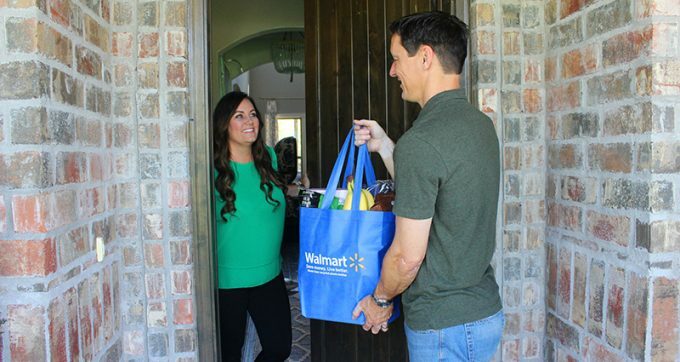 For Walmart, the new partnership is a step towards its goal of covering 100 metropolitan areas in the US with grocery deliveries by year end, which would account for 40% of US households. By July its home deliveries were in 30 US markets. Walmart’s push for grocery deliveries across the US suffered a setback in June when its partnership with Uber – launched with loud fanfare two years earlier – came to an end with the demise of UberRUSH. The ride-sharing platform decided to put an end to the collaboration with Walmart in New York City, San Francisco and Chicago. And around the same time, the retailer’s collaboration on the last mile with Lyft ended. According to Walmart, it was a partnership that never expanded beyond the pilot in Denver. However, Bringg appears to be on a roll. In January, it garnered $12m in investment, adding to $10m drawn in last year. Among its backers is Coca-Cola, which has used the service for services from restocking to equipment repair support in a number of overseas locations. Nevertheless, Horst Manner-Romberg, principal of parcel research and consulting firm M-R-U, has reservations about the viability of crowd-sourced delivery options. None had managed to solidly establish itself in the market, he said. There is no single determining reason why crowd-sourced delivery enterprises have not found success, but a number of factors are stacked against them, he said. The final-mile segment is fiercely contested, which has created a difficult situation, characterised by low earnings and high costs. The entrenched couriers leverage their networks to keep crowd-sourced competition at bay, Mr Manner-Romberg noted. And for many potential drivers, tax rules are a deterrent, he continued. In Germany, the inland revenue department classifies income earned from deliveries as proceeds from a fully fledged business once a threshold of deliveries has been reached. This means higher tax rates and a possible loss of benefits. Finally, the market itself is rather limited, Mr Manner-Romberg said. Crowd shipping is focused on the same-day delivery segment, which is a niche area. He views investment in crowd-sourced delivery ventures as a case of too much money in the market chasing few investment opportunities. For the most part, these enterprises fail to gain traction. “There are one to three start-ups a week. Most are gone after a few months,” he said. And it remains to be seen if DHL can succeed in this space. In March, the integrator announced an initiative in the US called Parcel Metro to create “a virtual delivery network” of local and regional contract couriers and crowd-sourced providers for flexible last-mile deliveries. It kicked off in Chicago, New York and Los Angeles and was supposed to expand to Dallas, Atlanta, San Francisco and Washington before the end of the year.